Princeton heichlichtit in Mercer Coonty. Inset cairt: Mercer Coonty heichlichtit in the State o New Jersey. 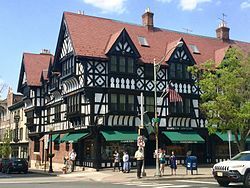 Princeton is a municipality wi a borough form o govrenment in Mercer Coonty, New Jersey, Unitit States. 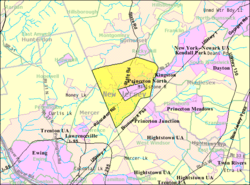 ↑ 1.0 1.1 County Subdivisions: New Jersey - 2010 Census Gazetteer Files, United States Census Bureau. Accessed May 20, 2015. Data was calculated by adding values for the pre-consolidation Princeton Borough and Township. ↑ Administration, Princeton, New Jersey. Accessed January 1, 2013. ↑ Office of the Clerk, Princeton, New Jersey. Accessed January 1, 2013. ↑ DP-1 - Profile of General Population and Housing Characteristics: 2010 for Princeton township, Mercer County, New Jersey, United States Census Bureau. Accessed August 20, 2012. ↑ Municipalities Grouped by 2011-2020 Legislative Districts, New Jersey Department of State, p. 8. Accessed January 9, 2013. ↑ Profile of General Demographic Characteristics: 2010 for Princeton township, New Jersey Department of Labor and Workforce Development. Accessed August 20, 2012. ↑ DP-1 - Profile of General Population and Housing Characteristics: 2010 for Princeton borough, Mercer County, New Jersey, United States Census Bureau. Accessed November 20, 2012. ↑ Profile of General Demographic Characteristics: 2010 for Princeton borough, New Jersey Department of Labor and Workforce Development. Accessed November 20, 2012. ↑ PEPANNRES - Annual Estimates of the Resident Population: April 1, 2010 to July 1, 2014 - 2014 Population Estimates for New Jersey municipalities, United States Census Bureau. Accessed May 21, 2015.